Well, that was quite an update! I think it is fair to say the most obvious part of that update is the brand spanking new Front Cover art! As ever Andy did an amazing job, I’m sure everyone will agree. We get an inkling (sorry!) of just how much work is involved from an article he did two covers ago (“…Hold The Front Page!…” or “How Staggering Stories Artwork is Created”). I did the easy bit of assembling the bits into the final page and that alone took several hours which is nothing compared to the weeks of work Andy must have put in. So a big thank you to him. 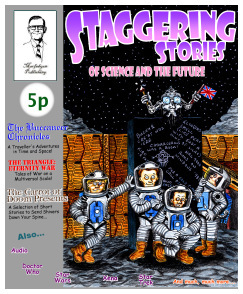 Staggering Stories started out without this type of front cover and I’m really glad we’ve got them now – they make such a great first impression. 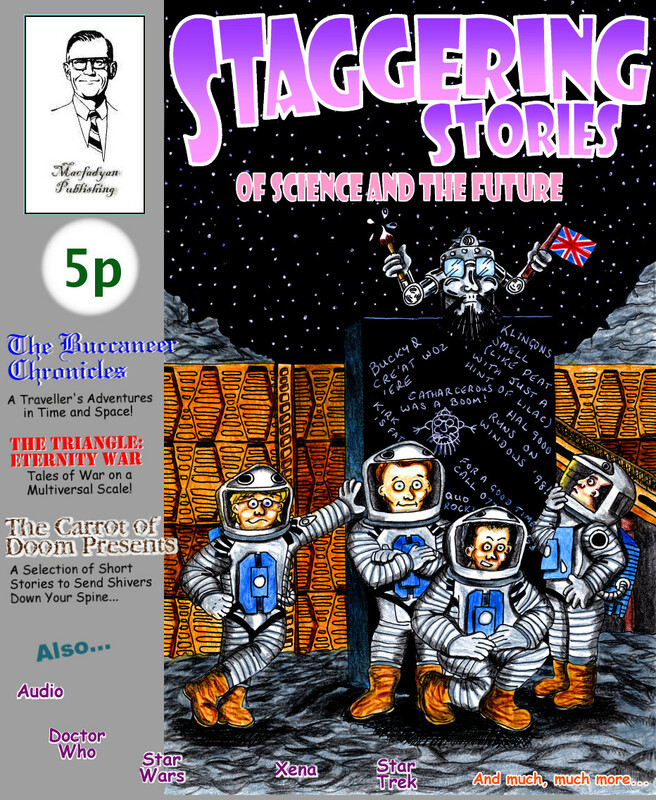 If only I had the graphic design capability to make the rest of the site look even half as good as those covers! Incidentally you will find all five, along with countless other wonderful pieces of art, in The Gallery. Keep focused topics – there aren’t many podcasters who can make idle chit-chat sound interesting, I doubt we’d be an exception. A regular schedule. In our case it will probably be monthly. That’s really a bit long between podcasts, the vast majority (that I listen to, anyway) are weekly, some fortnightly. I don’t think we’d be able to manage more than monthly, however. Whatever the schedule though, don’t go messing about with it all the time! Probably about four of the podcasts I used to regularly listen to are currently being rather sporadic and it irritates the hell of of me. I’ve dropped one already (and I’m not alone). We mustn’t fall into that trap. Edit out the cruft. The verbal, er, umm, stumbling and the pointless rambling off into non-subjects that no one wants to hear… We don’t want a long rambling podcast, it has to be punchy and not at all over long! More than anything else: be entertaining! That’s the really tricky bit. It must be fun for us to do it (or what’s the point) and it must be equally fun (or at least informative..?) for people to be willing to spend their time listening to it. This entry was posted on Tuesday, May 29th, 2007 at 17:52 and is filed under commentary, podcast, staggering stories, Staggering Stories Musings Podcast. You can follow any responses to this entry through the RSS 2.0 feed. You can leave a response, or trackback from your own site. 4 Responses to "May 2007 Staggering Stories Update"
I notice you’ve put the price up again. We’re not made of money you know! um…ok….for those that wonder, ‘conrad’ is Alister – you may remember he popped up for the weekend waaaaayyyyy back when…..its his voice in the Catharcerous trailer as both Rablan and also the seer type chappy…. As i told Tony, i had a listen to his vocal musings at about 6 in the morn, having been up all night, and still managed to stay tuned in and be entertained by it. In conjunction with some work im doing myself, that tends to be very dry and way to academical in written format, its a very inspiring example. Sorta like yea that might just be the way to go, to get more people to listen type thing, or get the real meaning of it all across with some better intonation. When you structure it a bit more and get rid of the umms and awwws your sorted completely, as a first go it hits the spot.